AP, The World Food Prize FoundationFrom left: Robert T. Fraley and Mary-Dell Chilton of the United States, and Marc Van Montagu of Belgium. In 1986, Nobel Peace Prize laureate Dr. Norman Borlaug created The World Food Prize in an effort to recognize, "the achievements of individuals who have advanced human development by improving the quality, quantity or availability of food in the world." Though it's a big deal in the agricultural community, the prize is rarely talked about in mainstream media. But this year, everyone's abuzz about the selections, especially the two from the U.S.: Dr. Mary-Dell Chilton of Syngenta (SYT) and Dr. Robert T. Fraley of Monsanto (MON). 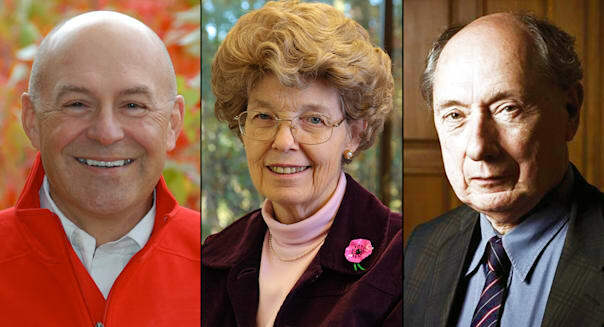 They, along with Marc Van Montagu, a Belgain biotech and GMO pioneer, are being awarded the prize on Oct. 16 for their work in developing genetically modified organisms, mainly in the form of crops that are resistant to insects and diseases. Folks say that one shouldn't talk politics or religion at the dinner table, lest a fight break out. These days, you can add GMOs to that short list of ultra-touchy topics. %VIRTUAL-article-sponsoredlinks%The dawn of genetically modified food began in America in the 1990s with the approval of a GM tomato. Since then, a number of cash crops have quickly been converted to GMOs -- including corn, soy, rapeseed (pressed to make so-called "canola" oil), and cotton. The byproducts of these crops can be seen in a dizzying number of options at any local grocery store. Proponents argue that the benefits of GMOs speak for themselves: improved crop yields, resistance to insects and disease without use of as many pesticides, the ability to withstand extreme variability in climate, and added nutritional value (when they're designed to have it). Those against GMOs argue that this sort of fundamental tinkering with Mother Nature is inherently a recipe for disaster. They cite the arrival of super weeds and super bugs resistant to GMOs, the unintended effects on insects and wildlife (especially bees), and the possibility of human health problems -- ranging from allergies to endocrine disruption -- as symptoms of a process that's causing more trouble than it's worth. In this context, the World Food Prize takes on added importance, because it could bestow greater legitimacy to GMOs. And while it might seem to U.S. consumers like that legitimacy has already been established, given the ubiquity of GMOs in our food supply, the same cannot be said for most of the rest of the world. Large swaths of the European Union and, increasingly, developing countries from Central and South America have banned some, if not all, forms of GMOs. Along with Monsanto and Syngneta, fellow GMO suppliers DuPont (DD) and Dow Chemical(DOW) would have a lot to gain by opening up these markets to their products. Indeed, in its latest earnings report, Monsanto disappointed investors by reporting a 38 percent drop in sales of its GM soybean seeds, and lowered guidance for the rest of the year. DuPont and Syngenta have had seed cultivation approval requests waiting in limbo from the EU for years. Opponents of the proliferation of GMOs, however, don't intend on allowing these seed manufacturers to benefit from this good publicity without a fight. Protests are already planned to take place in Des Moines, Iowa -- where the prize will officially be presented; and on-line petitions have been circulating demanding the World Food Prize Foundation to reconsider. It's highly unlikely that these actions will strip the prize out of these scientists' hands, but what's more important is how this will all play out in the public sphere, and what effect -- if any -- it all has in the minds of international legislators deciding the fate of GMOs in their respective countries. Motley Fool contributor Brian Stoffel has no position in any stocks mentioned. The Motley Fool has no position in any of the stocks mentioned. Try any of our newsletter services free for 30 days.